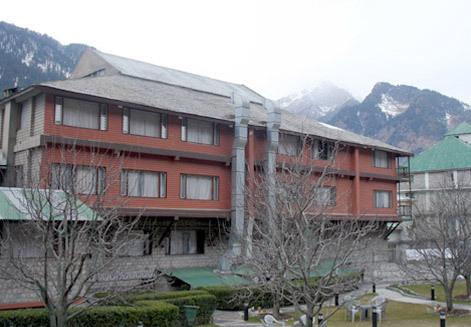 Locational Advantage : Honeymoon Inn Manali is close to Mall Road. Hotel Honeymoon Inn is sitauated in the heart of Manali, in the splendor of the majestic Himalayas, offering an excellent view of the snows, deodar woods and the wide valleys of wild flowers and fruit laden orchards. It is an ideal retreat for the romance life of guests with their loved one. The hotel offers a total of 59 centrally heated and elegantly furnished rooms totally designed for full comforts having a separate sit out and private balconies. All the rooms are featured with attached baths, CCTV with satellite entertainment, Channel music, 24 hours room service etc. Credit Card Facility, Doctor on Demand, Bar Facility, Games Room, 24 hrs H/C running water, Library, Car Parking, Restaurant, Safe Vault with Cashier, Personal man-servant, Wheelchair, Wake up alarm service, Travel Desk Facility, Direct Dialing STD/ISD Facility, Free Room Service, Postal Services, News Stand, Medical Facilities, Internet Facility, Hair Dryer, Front Desk, Conference Facilities, Massage Parlor, Discotheque, Baby Sitting, Banquet Facility, Billiards, Shopping Walkway, Courier Service, Fax on Application, Gym, Laundry Facility, Currency Exchange, Free Newspaper, Standby Generator, Safe Deposit Box, Secretarial Assistance, Spa, TV.